Diesel Scandal. Which effects nearly the entire Volkswagen line including the Passat. Volkswagen is currently the largest automaker in the world, larger than Toyota and General Motors. Volkswagen is the parent company of Audi (some of the Audi Diesels were included in the scandal), Bentley, Bugatti, Lamborghini, Porsche, Seat and Skoda. The company also builds commercial vehicles and motorcycles. VW was once a major player in the American market. For years, Volkswagen outsold every foreign automaker. Today, Subaru sells more cars than VW. Volkswagen created the current Passat for the American market. The former generations were smaller and more expensive and the company needed a car to compete in the very competitive mid size segment. The current model is larger than Passat’s sold in Europe. The current generation Passat has been around since 2012 and built in Chattanooga, Tennessee. The car has been refreshed through the years and there have been several engine changes. From the rough 5 cylinder to the current 1.8 turbo. A few months ago I rented a 2015 Volkswagen Passat SE (the basic model) and drove over 3300 miles. It was driven through mountains, deserts, mud, rain, and back roads, and freeways. I have driven more miles in the Passat than in my personal car this year. The 2016 received a much needed technology refresh. Despite having an out of balance tire, the 2015 Passat was a champ. The car feels solid. Being a big/tall man I appreciated the ample space front and back, I have driven full size trucks with less room. There is more leg room in the mid size Passat, then in the full size Chrysler 300 and Ford Taurus. Visibility was close to flawless The fit and finish was good. The trunk is beyond huge. The Passat is a fun to drive brick (squarish car), the 1.8 turbo had ample reserve power, braking was good and the fuel economy was superior. A V6 is available. The ride was German firm. It averaged 36 miles per gallon up to 41 miles on the freeways. The computer promised nearly 700 miles on a tank. I got close to that at 661 miles. If you have tallish teenagers, or frequently carry big or tall passengers this is your car. For 2015 the Volkswagen Passat was a top safety pick. While the Passat was designed for the American market, its controls are more German. If you’ve driven an American, Japanese, or Korean car, its will take a while to adjust to some of the controls,especially the cruise control. It’s still a brick, which looks very expensive in Black. I drove the mid level SEL, which came with Power and heated seats, a very nice sounding Fender head unit with Nav. For 2016 they have added quite a few USB and charging options. Apple Car Play and Android and a host of safety up dates like Automatic Braking and Frontal Collision packages have brought the car up today. My 2016 Passat was quieter than the 2015. The materials are a bit better and its the car your friends will demand on those long road trips. With the exception of the Volkswagen Tiguan . Volkswagen sales across the board is down. So deals are available. Resale on the gasoline models hasn’t taken a huge hit, reviews on the line has been positive including the refreshed Passat. The diesel scandal doesn’t just effect the US its International. Volkswagen has had a US presence for nearly seventy years however, if the low sales continue the network may take a hit. The Passat isn’t swoopy like a Fusion, Sonata, or Optima, its a brick. In some colors its bland, in fact it seems bland inside and out. In other colors it can look like a Mercedes. The car is fun to drive, its incredibly roomy, has a huge trunk and gets very good mileage. If you have growing teenagers or frequently transport four adults there are few cars that compare. 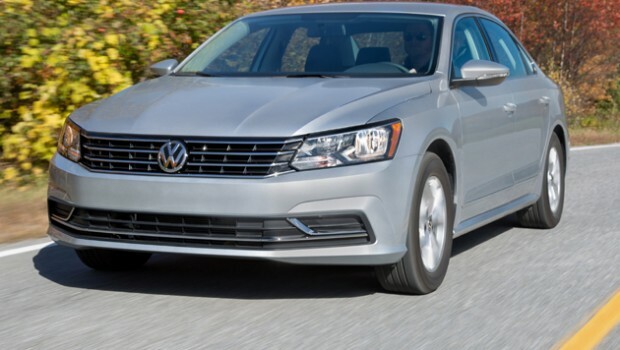 This entry was posted in Automobiles, Big Man Rides(Review), Cars, NATIONAL and tagged Automobiles, United States, Volkswagen, Volkswagen Passat. Bookmark the permalink.